I played "donkey.bas" - a computer game written in BASIC by Bill Gates - on this personal computer (PC), junior (Jr.), and other games such as "Think Quick", "Dig-Dug", "Space Invaders", and "Pac-Man". In "Think Quick", there were worm-like enemies that you were supposed to avoid. If they touched you, you were transported to some other game screen, which was supposed to be inside of the worm. These games had, at best, 4 color "CGA" graphics. I think I determined that this computer had "CGA" graphics through a process of trial-and-error which would occur whenever the games prompted me to choose a graphics mode before they would start. I have a very vague memory of witnessing some computer program that seemed to be making a drawing, revealed pen-stroke by pen-stroke on the monitor, as if a ghost was doing it. I think my dad was the person using the computer at the time, if and when it happened. I remember wanting and trying to find that program, not really knowing whether the drawing happened at the beginning, middle, or end of execution, and lacking fundamental comprehension of MS-DOS commands and filesystems. I remember 256 color, 320x240 resolution "VGA" graphics. Microsoft Windows 3.x ran with 16 color, 640x480 graphics, which was also called "VGA". The two "VGA" graphics modes offered a choice between more colors or higher resolution. I always preferred more colors, and I didn't understand why this trade-off existed. I tried several times to find a way to run MS Windows (which seemed to require 640x480 resolution) with 256 colors. I didn't like the "dithering" effect that Windows used to represent variations of its 16 basic colors. I remember the "dithering" showing up in MS Paint when I adjusted the color palette, which would indicate that my latest attempt at 256 colors had failed. I played "King's Quest" (16 color 320x240 "EGA" graphics version, copied from my uncle's computer onto a 3.5" disk), "King's Quest 5" and "6", "Wing Commander 2", "Wolfenstein 3D", "Sim-Ant" on this computer. I remember playing a version of "Sim-City" that was found on some random, unlabeled 3.5" disk. It was much worse than the later Super Nintendo version, due to inferior "EGA" graphics, no music (Super Nintendo version's was really catchy, I recall), and maybe also an anti-piracy mechanism that had adjusted the game's difficulty to impossibly hard. "Sim-Ant" was pretty cool, though. You could be run over by a lawn mower in that game. I might have played the shareware version of "Doom", which probably pushed the limits of the CPU, a 16 mhz Intel 386 with no "math coprocessor". "King's Quest 5" came on like 12 3.5" disks or something. I used this computer to make a few ray-traced images with an MS-DOS program called "Polyray", which I installed from a 3.5" disc that came with a book called "Adventures in Ray-Tracing". I found "Adventures in Ray-Tracing" in the computer book section of Barnes and Nobles. I remember Barnes and Nobles seeming really fancy because it had two floors, a cafe inside, some octagonal foyer entrance, a classy color scheme and wood-cut logo, and probably classical music was playing. Maybe somebody was even playing a grand piano in the store. "Polyray" images (the ones I made consisted of abstract/platonic scenes like colored, partially-reflective spheres stacked over black-and-white checkered or marble floors) began as text files which meticulously, quantitatively, unambiguously described, through a special syntax and format, the 3D geometry of objects, their colors and shininess, the positions of lights, the position of the camera, etc. The ray-traced images they defined took a long time to "render" on the computer screen, like 30 or 90 minutes, emerging in horizontal lines progressively drawn starting at the top of the screen, with each line visibly filled in one pixel at a time from left to right. The book had suggested to me that I would be able to easily create impressive, surrealistic images like the fantastic one on its cover, which showed a steam engine train on elevated tracks entering some castle-like structure, with a serpent floating in the air, all drawn with perfect fixed-point perspective and shading effects including shadows, reflections, and "specular highlights". A sound card compatible with this computer was incredibly rare, due to the unique and proprietary "Microchannel" architecture of the IBM PS/2, and cost $300 or something, if you could find it, which I never did in any computer store that I ever entered. So this computer usually just made beeping or chirping noises. However, in Windows 3.1 it was possible install an emulated sound card "driver", which enabled .WAV files to be played horrendously through the internal PC speaker. My next door neighbors' computer had much better sound capabilities, an undeniable fact which produced feelings of inferiority in me. 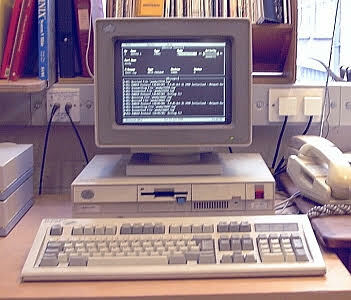 My older next door neighbor showed me how to write QBASIC programs on this computer. 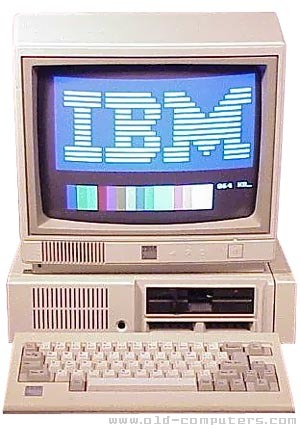 Me, my older brother, and my two next door neighbors were the most frequent users of these computers, until we left home, one by one, for college. During those years, my next door neighbors went through their own sequence of computers as well, but their computers were Apples, starting with an Apple IIgs. I wrote at least one "choose-your-own-adventure" style program in QBASIC, that I can remember... it included a situation in which the player is in the bathroom and the toilet paper has just run out.